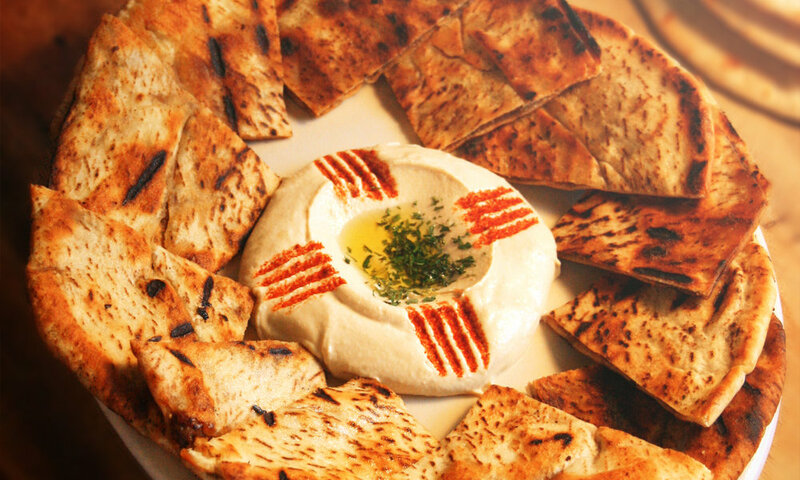 Since 2007, Zamzam has been the place where people connect over hookah, enjoy homemade hummus, grab a bite before or after sporting events, and so much more. And no matter what menu items they order, there’s one ingredient that’s always constant — a smile. For 10 years, we have served world famous gyros and a wide variety of kabobs, lunch and dinner items that are loved by people of all ages — offering an affordable, everyday dining experience with warm and friendly service. Fresh ground beef, grilled with our special seasonings and cooked to perfection, topping a spread of hummus and served with warm pita bread. Our famous chicken kabobs! Marinated with our special seasonings and grilled to perfection. Chopped into bits topping a spread of hummus and served with fresh pita bread. A creamy dip made from mashed chickpeas, tahini sauce, lemon juice, a hint of our special seasonings. Topped with olive oil and served with warm pita bread. Cooked vine leaves, stuffed with basmati rice and marinated to perfection with a special blend of lemon juice and seasonings. It doesn't get any better than this! Our famous beef and lamb gyro meat, grilled to perfection, topping a spread of hummus and served with warm pita bread. An all-time favorite! Cool and sour Greek yogurt dip garnished with dried mint flakes, topped with fresh olive oil and served with warm pita bread. Cooked fava beans, chickpeas, lemon juice, crushed peppers, and spices. Topped with tahini sauce, olive oil and served with warm pita bread. A creamy dip of roasted eggplants, tahini sauce, lemon juice, and a blend of our special spices. Topped with fresh olive oil and served with fresh pita bread. Slices of eggplants lightly fried and topped with our famous crushed green pepper sauce, garlic, lemon juice and served with warm pita bread. A delight dip of fresh and creamy hummus mixed with garbanzo beans and crushed peppers sauce. Topped with olive oil and served with warm pita bread. Ground chickpeas, parsley, onions, and a touch of our special seasonings, made into perfect patties, deep-fried, and served with tahini sauce. Our famous deep-fried falafel! Stuffed with a spicy mixture of onions, peppers, a blend of our special seasonings and served with tahini sauce. Our famous falafel patties wrapped in a warm pita bread with a spread hummus. Stuffed with tomatoes, pickles and topped with tahini sauce. Our famous gyros served Philly-style. Grilled gyro meat, with a mixture of sauteed onions and peppers. Topped with provolone cheese and tzatziki sauce. A perfectly seasoned kofta patty grilled to perfection and placed on a warm bun over a spread of hummus, topped with a slice of cheese, lettuce, tomatoes, and onions. A mixture of beef and lamb gyro meat wrapped in warm pita bread and stuffed with lettuce, tomatoes, onions, feta cheese, black olives and tzatziki sauce. Tender cubes of marinated chicken, grilled and wrapped in warm pita bread, stuffed with lettuce, tomatoes, garlic, and tahini sauce. Fresh ground beef seasoned and grilled to perfection. Wrapped in a warm pita bread with hummus, lettuce, tomatoes, onions, and a hint of tahini sauce. A well-seasoned mixture of beef and lamb gyro meat wrapped in a warm pita and topped with lettuce, tomatoes, onions, and our famous tzatziki sauce. Perfectly seasoned chicken, lightly grilled and wrapped in tortilla bread with pickled cucumbers and garlic sauce. Finely chopped parsley tossed with fresh tomatoes, onions, mint flakes, fresh cracked wheat and drizzled with olive oil and lemon juice. Chopped crisp lettuce, ‏ tomatoes, and cucumbers. Topped with black olives, feta cheese, and drizzled with our homemade dressing. Chopped crisp lettuce, tomatoes, and cucumbers. Topped with fried bits of pita croutons, and drizzled with our homemade dressing. A taste blend of fresh sour Greek yogurt mixed with chopped cucumbers, dry mint flakes, garlic and a hint of our special seasonings. Grilled chicken kabobs topping a mixture of crisp lettuce, tomatoes, cucumbers, black olives, and feta cheese. Drizzled with our homemade dressing and served with warm pita bread. Fresh gyro meat topped a mixture of crisp lettuce, tomatoes, cucumbers, black olives and feta cheese. Drizzled with our homemade dressing and served with warm pita bread. A delicious mix of rotini pasta, corn, red beans, black olives, feta cheese and drizzled with our famous homemade dressing. A perfectly seasoned kufta kabob patty topped with tahini sauce, potato slices, baked to perfection and served with warm pita bread. A perfectly seasoned kufta kabob patty topped with tomato sauce, potato slices, baked to perfection and served with warm pita bread. A perfectly seasoned layer of beef, topped with tomato sauce, eggplants and green pepper slices. Baked to perfection and served with warm pita bread. Four our tomato lovers! A juicy mixture of cooked tomatoes, garlic and our special seasonings, served with warm pita bread. Fresh ground kufta meat spread inside of our famous Arabic pitas. Grilled to perfection and served with our famous hummus dip. Fresh ground chicken mix spread inside of our famous Arabic pitas. Grilled to perfection and served with our famous hummus dip. Our famous chicken shawarma served dinner style! Well-seasoned chicken served with Greek salad, French fries, garlic sauce and warm pita bread. A delightful combination of creamy hummus, baba gannouj, grape leaves, tabouli, falafel, and yogurt salad. Served with warm pita bread. Grilled chicken kabobs topping a bed rotini pasta, corn, red beans, black olives, feta cheese and drizzled with our famous homemade dressing. Served with warm pita bread. A fresh marinated and seasoned fish grilled to perfection. Served with rice, Greek salad, parsley sauce and warm pita bread. The perfect combination of our famous kufta, chicken, and beef kabob. All seasoned with our special spices and grilled to perfection. The best of all! Enjoy a mixture of our famous kufta, chicken, beef, lamb and gyros. All seasoned and grilled to perfection. Seasoned ground beef mixed with finely chopped onions, parsley, and a touch of our special seasonings. Made into long skewers and grilled to perfection. Our famous chicken kabob! Tender cubes of marinated chicken, well-seasoned with our spices and grilled to perfection. Tender cubes of freshly and marinated beef. Lightly seasoned with our spices, herbs, and grilled to perfection. A perfect combination of kabobs, including kufta, chicken and beef skewers all served with fresh pita bread, white rice and four of the side dishes: hummus, baba Gannouj, labne, foul, falafel, Greek salad, fattoush salad, tabouli salad, yogurt salad, pasta salad. A mixture of our famous beef and lamb gyros. Freshly sliced and lightly grilled. Served with our fresh homemade Add to dictionary sauce. Tender cubes of fresh and well-seasoned lamb. Lightly grilled to perfection and served with your favorite sides. A local favorite! Slices of cucumbers pickles, breaded, dipping sauce. The perfect snack to go with your hookah! A delicious snack! Our thick and crispy mozzarella sticks, deep fried to perfection and served with ranch dressing. Ready for sharing and dipping! Our all-white-meat chicken strips are breaded and crispy-fried, then served with seasoned fries and ranch dressing for dipping. Can't decide? We've got you covered! A great combination of fried pickles, mozzarella sticks, chicken strips and seasoned fries. Served with ranch dressing. We are available on Postmates, Eat24 & BeyondMenu! To order, simply click on the logo, and you'll be directed to our page.